This Beautiful Heart Is Made Of White Cushion Chrysanthemums As The Back Ground It Also Has White Lilies And Red Roses To Make It Stand Out With The Beauty It Has The More Of The Price Is Adding More Of The Roses To The Heart Some Call This The Broken Heart,but I Call It Pure Love Heart. 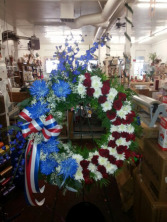 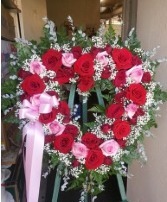 Solid Heart Wreath made with your love in mind. 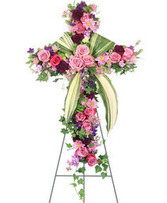 It stands alone in its beauty and softness. It shows the love of a giving person. 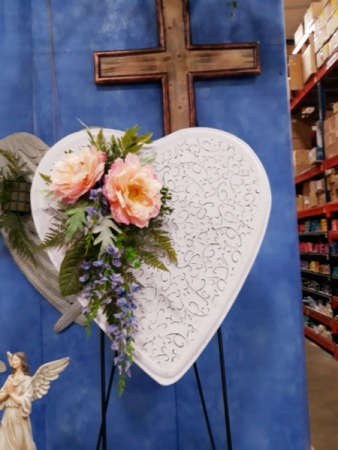 This Picture Is Made Out Of Silk Peach Colored Peonies,lavender Blue Wisteria, And Silk Greens, It Is Designed To Bring Out The Beauty Of This Heart Piece. 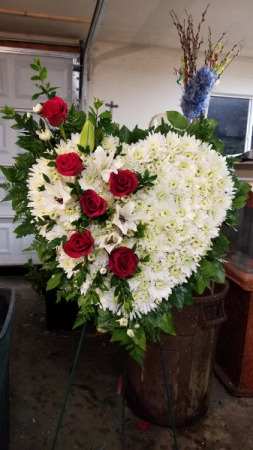 This beautiful white metal heart is done with silk flowers.It can be kept after the service and hung on a wall as a beautiful keepsake piece. 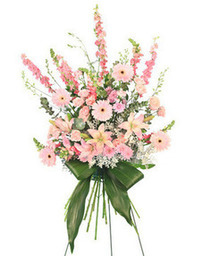 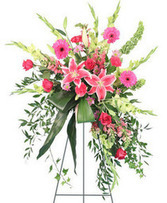 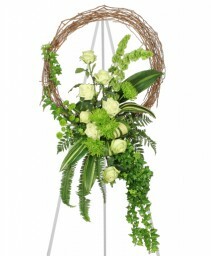 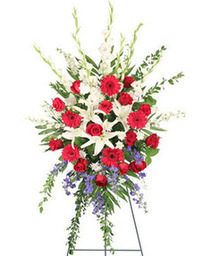 It may also be done with fresh flowers of your choice of colors. 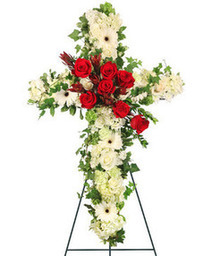 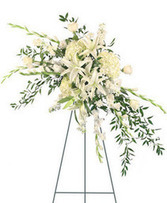 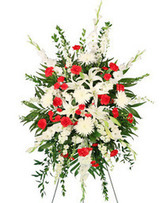 This One Is Made With Red Carnations,white Daisy Poms, Baby Breath,two Different Kinds Of Greenery To Give It That Look To Stand Out Roses Are Added To It At The Higher Price Along With Other Flowers To Match Your Colors To Add A Picture You Will Have To Call To Make The Arrangements For It To Be Added. 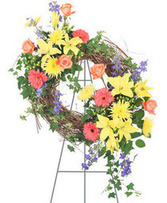 This square picture wreath can be made with your loved ones photo in the middle. 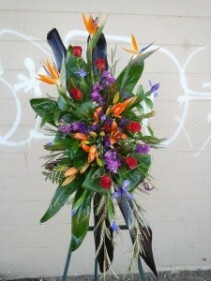 Colors can be changed and so can the flowers. It can be made to fill your wishes. 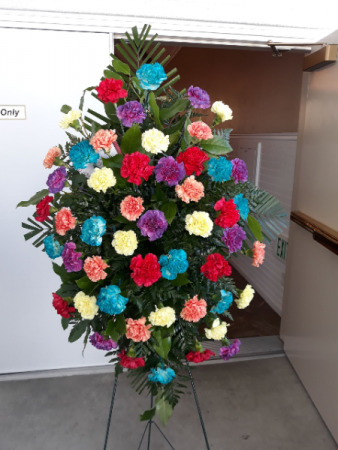 The Spray Can Be Made In Your Favorite Colors Too This Spray Shown Has Fifty Carnations The Size Is About Inches Wide By At Least Long The Size Does Change With The Different Prices The Designer Balances It Out To Look Its Very Best For You. 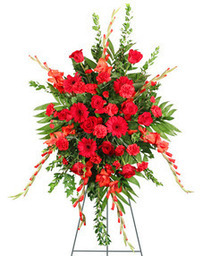 This beautiful designed spray is made of 50 colored carnations. 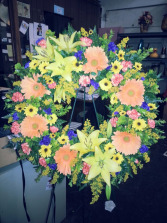 The colors are from the Disney movie Coco.It was created and designed for a special customer and it just has to be shared with you.